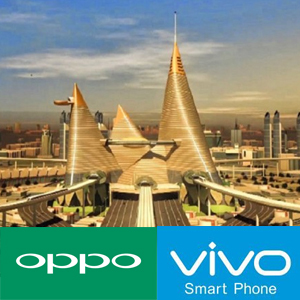 Handsets of Oppo and Vivo may have 'Made in Gujarat' or 'Made in India' labels soon. The company is sincerely thinking of having its first manufacturing plant in India and the Dholera (Special Investment Region) SIR in Ahmedabad district could be the destination for that. Sources from Dholera SIR Development Authority said, "The Oppo and Vivo delegation had visited the site and they are interested in manufacturing the entire series of their products including mobiles, LEDs and other equipment. They have great plans of investing in India and we gave them detailed presentation of the advantages of investments in Dholera." "The delegation was impressed by the presentation and especially the connectivity of the Dholera SIR region to ports and roads through DMIC, DFC and others. We have enough land to offer them. They wish to have the entire value chain set up at Dholera so that ancillary companies that provide raw materials to them are also lined up to invest here," added the sources. Besides Oppo and Vivo, Denmark-based wind turbines manufacturing company Vestas is also seriously thinking of having their set-up at Dholera. Tata is also mulling establishing their plant for lithium ion batteries here. "Tata Group chairman N Chandrasekaran had announced from the dais of the inauguration ceremony of Vibrant Gujarat Summit that their conglomerate planned to invest in lithium ion battery manufacturing in Gujarat. This plant will most likely come up at Dholera SIR," the sources further added. The sources from Dholera SIR Development authority also added that these companies had discussions with other state authorities as well for their set-up but Gujarat and especially Dholera, are ahead in the race. The CEO of Special Project of Dholera and Mandal Bechraji SIR, Jay Prakash Shivahare, said, "Initially, we had dialogues with many corporate captains for investments in Dholera SIR but they had several reservations, owing to some issues with the government. Recently, China-based Tsingshan Holding Group is investing Rs 21,000 crore in Dholera SIR with their Indian JV partner Chromeni Steel. This would propel other industries to come up at Dholera, we expect."